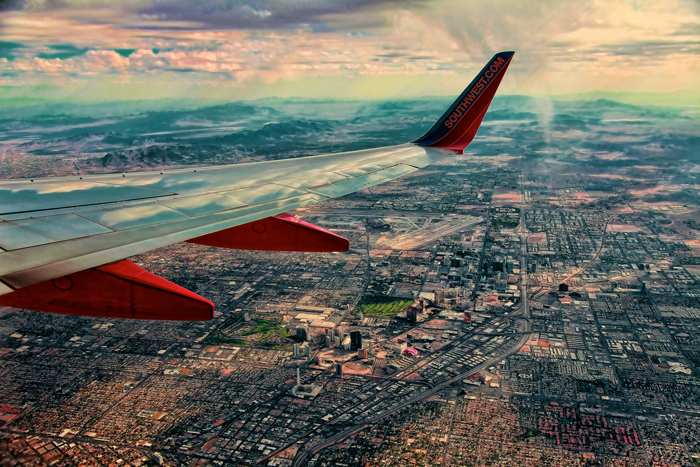 Aerial photo of Las Vegas, Nevada taken from a Southwest Airlines flight shortly after takeoff. The Las Vegas Strip can easily be seen, as well as many of the Las Vegas casinos, including the Stratosphere, Circus Circus, Encore and Wynn, The Mirage, The Palazzo, The Venetian and many more. View more of my Las Vegas photos taken over the past decade. Aerial photo of Las Vegas, Nevada by Joey B. Lax-Salinas is licensed under a Creative Commons Attribution-NonCommercial-NoDerivs 3.0 Unported License. Permissions beyond the scope of this license may be available at http://www.joeyblsphotography.com.